In the style of "Whose Line Is It Anyway?" and Chicago's Second City, the theatre's resourceful improv troupe takes comedy to new levels. 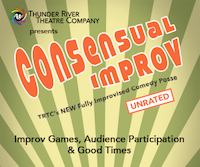 Enjoy improv games featuring spontaneous hilarity, audience interaction and lightning fast wit.